This image shows an artist concept of NASA's Mars Atmosphere and Volatile EvolutioN (MAVEN) spacecraft in orbit around the Red Planet. The Mars atmosphere probe will arrive at the planet on Sept. 21, 2014. A NASA Mars orbiter is on target to reach the Red Planet this weekend, right on schedule. NASA's Mars Atmosphere and Volatile Evolution probe, or MAVEN, is slated to arrive at the Red Planet around 9:50 p.m. EDT Sunday (Sept. 21; 0150 GMT Monday, Sept. 22), agency officials said. The spacecraft's handlers are reporting no problems during the home stretch of its 10-month space journey. As of Wednesday (Sept. 17), MAVEN was about 746,000 miles (1.2 million kilometers) from Mars, Mitchell said. From the spacecraft's perspective, its destination planet looks about as large as a baseball would from a distance of 52 feet (15.8 meters), he added. "Mars is really growing right now as we approach, just four days away," Mitchell said during a press briefing Wednesday. If all goes according to plan, MAVEN will fire its engines for about 33 minutes on Sunday night, slowing down enough to be captured by Mars' gravity into a highly elliptical, 35-hour orbit. Over the next six weeks, the mission team will check out MAVEN's instruments and maneuver the probe into its final, 4.5-hour orbit, which will bring MAVEN as close as 93 miles (150 km) to Mars and as far away as 3,850 miles (6,200 km). Artist's concept showing the orbital insertion process for NASA's MAVEN probe, which is scheduled for Sept. 21, 2014. The main goal of the $670 million MAVEN mission — which launched from Florida's Cape Canaveral Air Force Station on Nov. 18, 2013 — is to help scientists better understand how and why Mars shifted from a relatively warm and wet world billions of years ago to the cold, arid planet we know today. 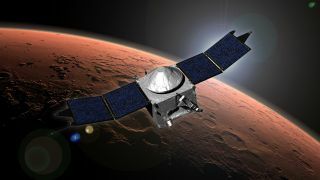 "The MAVEN mission is about understanding the history of the climate on Mars," said principal investigator Bruce Jakosky, of the Laboratory for Atmospheric and Space Physics at the University of Colorado, Boulder. The water of early Mars could either have retreated into the planet's crust or escaped into space, Jakosky explained. MAVEN is carrying three instrument suites that will measure and characterize gas escape from the upper atmosphere, allowing mission scientists to extrapolate this process back in time. "What we're going to be doing is studying the top of the atmosphere as a way of understanding the extent to which stripping of gas out of the atmosphere to space may have been the driving mechanism behind climate change," Jakosky said. "We should be able to get enough measurements to tell us what happened to the water, what happened to the carbon dioxide." MAVEN's prime science mission is scheduled to last one year, but the probe is carrying enough fuel to last for many years on orbit, mission team members said. Mars will welcome another robotic visitor just days after MAVEN gets there. India's first Red Planet effort, the Mars Orbiter Mission (MOM), is scheduled to arrive on Wednesday (Sept. 24). The $70 million MOM is primarily a technology demonstration, though it will also hunt for methane — a gas that here on Earth is primarily produced by living organisms — in the Red Planet's atmosphere.